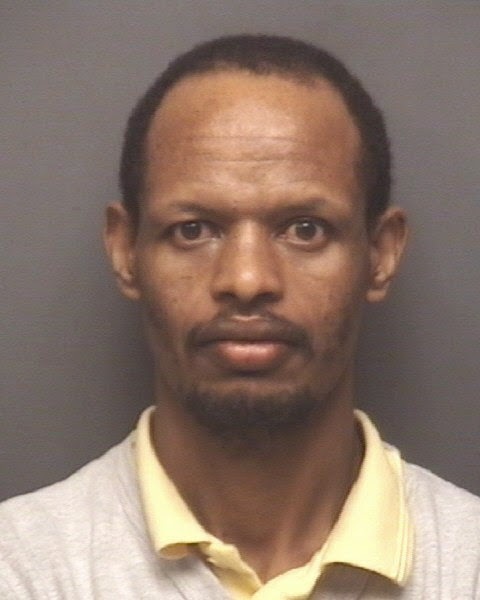 An Ethiopian refugee will spend at least 12 years in prison after pleading guilty Tuesday in the 2013 strangulation death of his wife during a fight about money. Arab Mohamed Ali, 35, was charged in February 2013 with the first-degree murder of 23-year-old Safaya Dadacha. He struck a deal Tuesday with the High Point District Attorney’s Office and pleaded guilty to the lesser charge of second-degree murder, receiving a sentence between 12 and nearly 15-and-a-half years imprisonment with credit for time served. High Point police responded the afternoon of Feb. 18, 2013, to 2113 Wingate Place in reference to a domestic violence call, prosecutor Christon Halkiotis said during the Tuesday proceedings. Ali called 911, she said. Officers found Ali and the two children he had with Dadacha, ages 5 and 2, outside the residence. Dadacha was discovered on the floor inside, unresponsive, her head covered by a green cloth. Halkiotis said police asked Ali if the woman was asleep. “‘I think she died,’” Ali responded, according to the prosecutor. “Officers noted the defendant was not emotional and did not act as if anything was wrong.” Officers uncovered Dadacha, summoned for EMS then moved throughout the house to make sure no one else was inside, Halkiotis said. When they returned to Dadacha, the green cloth again was draped over her head. Detectives later determined that type of covering is a custom for the dead in Ethiopia, the couple’s native country. “Officers noticed signs of ligature strangulation,” Halkiotis said. “EMS arrived and began tending to the victim. Officers noted there were food items in the kitchen which looked like someone was preparing a meal. They also noticed a steak knife lying on the floor.” When emergency personnel transported Dadacha from the home to the hospital, she was still alive. Ali told police his wife had cut him on his hand the week before, Halkiotis said. “He claimed she slept with a knife and threatened him with it,” she said. “He said that she ‘makes me crazy.’” Ali told detectives he had given her a check, and she and her brother had changed the amount. They argued that day about money. “He claimed his wife attacked him and grabbed him by the throat and threw a knife at him,” Halkiotis said. Their children were downstairs at the time of the struggle. Ali admitted he grabbed his wife around the neck while they fought, he pushed her away and punched her. “He then claimed his wife started to strangle herself with a scarf,” the prosecutor said. Ali reported he went outside and, when he returned, his wife was unconscious on the floor. Detectives also interviewed Dadacha’s brother, Kamal Dadacha, who said he previously had seen the couple argue about money. He also said Ali had struck his sister in the past. Dadacha’s sister told him her husband did not give her money for the children and she had thought about leaving with them. Ali reportedly told his wife, “If you ask me again, I’m going to kill you,” Halkiotis said, referencing what Dadacha told detectives. Detectives originally charged Ali with attempted murder. When Dadacha died from her injuries the following day, on Feb. 19, 2013, he was charged with first-degree murder. Superior Court Judge John O. “Joe” Craig III told Ali via an interpreter on Tuesday that the second-degree murder charge to which he was pleading carries a maximum punishment of life in prison without parole. Ali stood before him in an orange jumpsuit marked with black letters, “Guilford County Jail,” and answered the judge’s questions through the interpreter, who translated the Oromo language by phone from Washington state. The plea arrangement to which Ali was agreeing stipulated he would be sentenced at the bottom of the mitigating range, 144-185 months, Craig said. If Ali does not have U.S. citizenship, his guilty plea could result in deportation. Craig asked if Ali accepted the arrangement. “Yes, what else can I do, your honor?” Ali said through the interpreter.Ali’s attorney disputed he was emotionless. Ali and his wife were refugees originally from the Oromo area of Ethiopia, Hammer said. Subject to persecution, they fled to the United States. Craig found those mitigating factors and sentenced Ali to a minimum of 144 months and a maximum of 185 months in prison with credit for time served. Attorney’s fees and court costs will go to a civil judgment due to his lengthy prison term. Kamal Dadacha was in the courtroom as Ali was handcuffed and escorted out by bailiffs.